What is the Difference Between a Pergola and an Arbor? The words pergola and arbor are often used interchangeably to describe two similar outdoor structures. Both are built with posts that support an open roof of beams or lattice. And both usually support vines or climbing plants. What used to be simply called a patio roof during the post-World War II housing boom–when outdoor projects proliferated and Lane Publishing (Sunset Books) stepped up its production of how-to guides for everything–is now referred to as a pergola, and sometimes, an arbor. Pergola comes from the Italian word pergula, which means projection. This refers to the wood structure in Roman gardens that projected from exterior walls and was supported on one side by columns or pillars. Pergolas were built as architects of the Italian Renaissance tried to reproduce the villas of Imperial Rome. In its earlier forms in 19th-century gardening books, pergolas were described as "covered (usually with vines) walks." Arbors date back to early Egyptian and Roman gardens and were used throughout Europe by the late 16th century. The term arbor, or arbour, is an English word, believed to be derived from the Old French herbere or Anglo-French herbe, meaning herb or grass. However, in residential applications, an arbor is considered a freestanding structure that serves as an entrance to a part of a yard or garden. It can also act as a small shelter for a bench or seating area, often with plants climbing or vining up and overhead. Arbors include two or four posts with a simple slatted roof (often arched, but not always). The sides of an arbor can be open over covered with lattice or trellis work for a more enclosed effect and to help vines better attach. An arbor can be bought, made from a kit, a do-it-yourself project, or can be custom-built by a carpenter or contractor. It can be made of wood, metal or vinyl. Often built over a patio or deck as a shade structure, a pergola is also based on a similar post-and-beam construction as an arbor. When attached to a house, a pergola will extend from the exterior side or roof, creating a shaded or semi-shaded space that links the interior of the house to the landscape. In other words, it provides some sort of roof for a patio, deck, or outdoor room. A pergola can be connected to a house on at least one side, consist of a series of independent columns supporting beams that form an open roof, or be a freestanding structure. As a freestanding structure, a pergola can be identified by having four or more posts or columns. It supports a roof that is traditionally flat, with beams left alone in one direction or topped with cross beams or slats. The pergola's roof can be left open, covered with weatherproof fabric or another lightweight material, or support fast-growing vines. If the vines or cloth cover one side of the pergola and patio area, it can serve as a privacy screen and also block an unsightly view of your neighbor's yard. A pergola is usually built from a kit, is a do-it-yourself project made from plans, or can be custom-built and designed by a contractor. Size, budget, time, scope of project, and your own DIY skills and level of enthusiasm will determine who builds it and how it gets built. 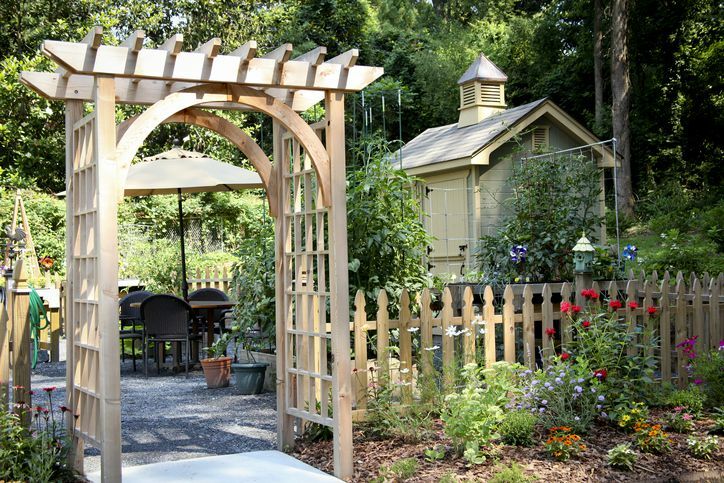 Originally created to support a climbing plant or vine, a pergola is one of the earliest types of garden structures. Pergolas were used in Ancient Egypt, Greek and Rome. Egyptian pergolas were made of roughly shaped pillars, eventually becoming more elegant, with painted colors and sculpted details. In the late 1800s, pergolas were popular in England to support and show off beautiful vines and flowering plants, like roses, honeysuckle, wisteria, and clematis. What is an accessory building?